A strong brand represents why a company exists and for what it stands. Amtrak sums up its brand essence as “Simply a smarter way to travel.” America’s Railroad offers a transportation choice with comfort, freedom, service and value. It crosses the nation downtown to downtown, community to community, connecting more than 500 destinations. “Amtrak’s new brand campaign speaks to the uniquely enjoyable experience of rail travel.” - Darlene Abubakar, Amtrak acting vice president brand management and marketing. 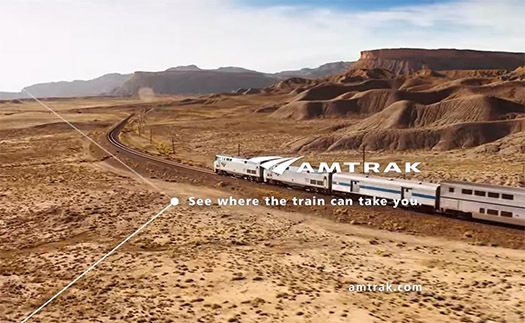 As part of its master brand program, Amtrak recently unveiled a nationwide brand campaign inspired by passengers' travel experiences: “500 Destinations. Infinite Stories”. The storytelling at the heart of the campaign focuses on the unique experiences and adventures only rail travel can provide. “We are reinvigorating the Amtrak brand by celebrating thousands of travel experiences while simultaneously reinforcing what longtime Amtrak loyalists love about America’s Railroad: comfort, convenience and a commitment to excellent customer service,” says Darlene Abubakar, Amtrak acting vice president brand management and marketing. Amtrak.com received a new look this summer in keeping with the refreshed visual identity associated with the master brand. The updated design incorporates new photography and “journey lines” joined at round connection points. The website refresh is one of the first steps of a larger program to provide Amtrak customers with a modern experience for booking their tickets, modifying their travel plans and learning about train travel. For a business enterprise with a national scope, a catchy name and logo are essential brand elements that help create a unified corporate image easily recognized by the public. 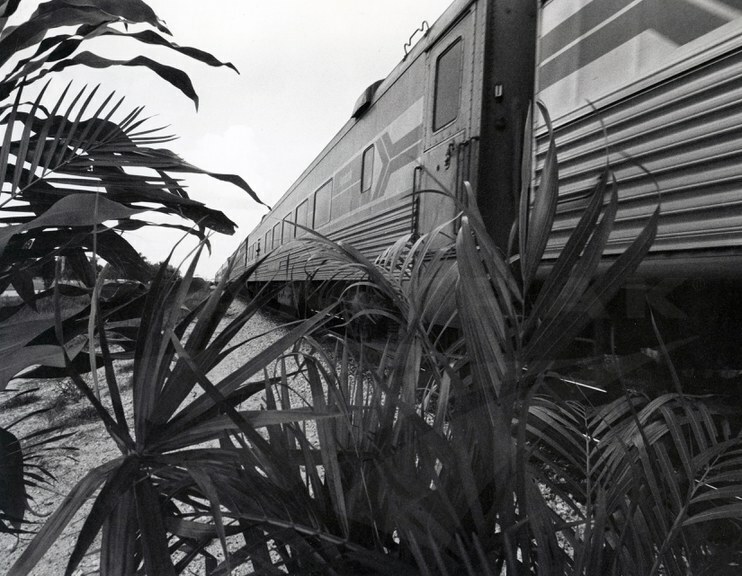 This was especially true for the newly formed National Railroad Passenger Corporation, established by an act of Congress in 1970 to operate the country’s intercity passenger rail system. One of the first steps taken by the young company was the creation of a more relatable brand name. Although “Railpax” was initially used, it was soon replaced by “Amtrak,” a blending of the words “American” and “track” developed by communications and design firm Lippincott & Margulies. “Amtrak” was considered “a short, powerful name, easy to pronounce and remember, with high visual impact..." The firm also created a “crisp, modern” graphic identity for the company defined by the patriotic colors of red, white and blue. Amtrak quickly painted its fleet of cars with the new service mark. The original service mark remained in use until fall 2000, when Amtrak launched a rebranding effort following two years of research examining how the old brand was perceived and used.1 The refresh was based on a new “Satisfaction Guarantee” in which Amtrak promised to make every trip a “safe, comfortable and enjoyable experience.” If Amtrak employees were unable to make things right for a customer, he or she could ask for a Service Guarantee Certificate toward future rail travel.2 The rebrand also coincided with the introduction of high-speed Acela Express service in the Northeast. 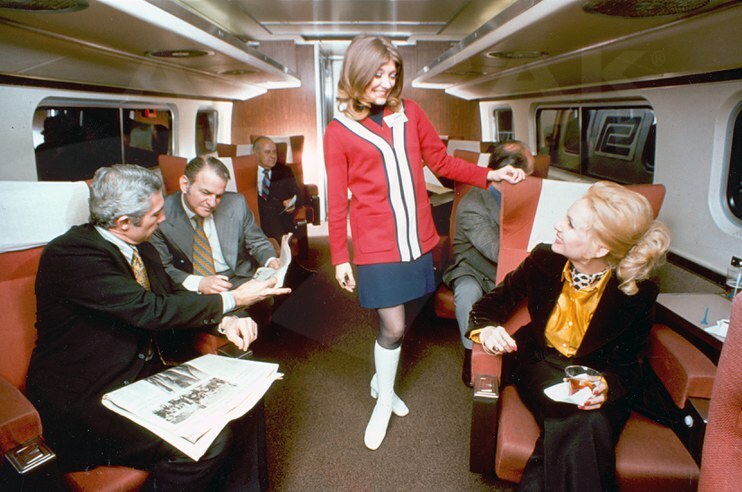 Designer Bill Atkinson worked the service mark into uniforms introduced in 1972. The text of this cartoon by CL Katz from the September 2000 issue of Amtrak Ink reads: "Old Logos Don't Die...They Just Become Collectible." The current service mark features prominently in the new national brand campaign, as do "journey lines" representing "where the train can take you." In the 15 years since the refreshed brand went into effect, Amtrak successfully introduced high-speed rail in the Northeast; entered into partnerships with states including Maine, Illinois and Virginia to launch new trains and additional frequencies; advanced passenger service enhancements such as automated voice response technology ("Julie"), eTicketing and AmtrakConnect Wi-Fi; and grew national ridership by approximately 47 percent (FY 2000-FY 2014). 1 “Brand New,” Amtrak Ink, July/August 2000. 2 “Amtrak – The Company that Guarantees Guest Satisfaction,” Amtrak Ink, July/August 2000. 3 “A Fresh New Look for a Revitalized Amtrak,” Amtrak Ink, July/August 2000. 4 “Brand New,” Amtrak Ink, October 2000.